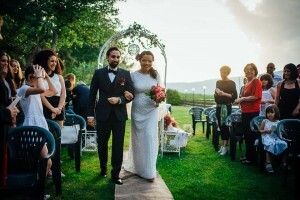 Giulia and Andrea captured our Italy wedding beautifully, and were easy and fun to work with. They were extremely accommodating to the specific needs of our event. We travelled from Los Angeles, even going so far as to helping us find a makeup person and a fiat cinquecento for that special touch. We love the style that they shoot in and will cherish the video and photos forever. We highly recommend them, without any reservation! !